It’s interesting to see the range of home amenities used by Amish. When it comes to cleaning products, you get families who buy fine hand lotions from places like Wal-Mart to those who still make their own soaps. Here’s a close-up. If I didn’t know otherwise, I might have guessed this was some sort of cheese curd (maybe I’m just hungry right now). First get all the dirty lard together, put it in the kettle and melt it. Then weigh it after it melts. After its weighed out, let that cool off and put it aside. Then put lye and water together and let it cool off. Then simmer lard int the lye and water, stirring it until thick. Have always wondered about this!! Thanks for sharing. Question for anyone — How does one go about adding “scents” to these soaps, or is that not done, because of different beliefs? Also, what is meant by “dirty” lard? And, does it “sit” somewhere, until it is hardened and then cut into bars, or what? I am learning so much about this area of the U.S.!! This website is a great place, and learning something new each day! I look forward each morning, to see what else Amish America has to offer! By “dirty lard” they mean unrendered pig fat. To render the lard, you chop up your pig fat and put it in a pot with some water so it doesn’t scorch and melt it. The bits that don’t render are the cracklins. Those need to be strained out and can be eaten. I believe if you used beef fat it would be the same process for rendering, I don’t know what those by-products are called though. I wonder if you can use the Armour brad lard from the grocery store? Yes, armor lard would work too. The process of making cold processed soap is more complicated then it sounds, at least until you get experienced at it. If you want to make your own, just search “homemade soap recipes” on-line and you’ll find everything you’ll need to know. Thank Erik for posting recipe for home made soap, I believe they don’t care much about scent, it has to wash off dirt. But some lavender oil would be nice. Amish women love to put lavender oil in their soaps for themselves and the little ones. The men prefer to have plain soap. The soaps the Amish continue to make remind me of the old soaps an older lady made that lived near us growing up. 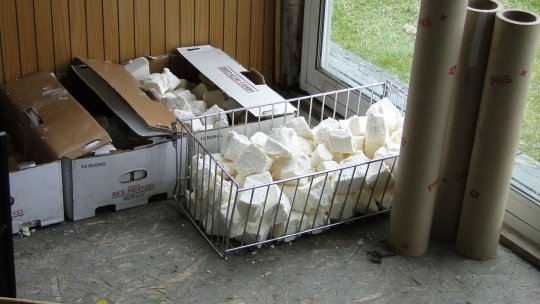 She refused to buy store bought soap and about twice a year made her own and stored it in the basement. Most of their soap is laundry soap. They either put the whole bar of soap in the wash tub until the water is soapy and then take the bar out or shave slivers off the bar and throw those into the hot water. The same bars of soap are also used as dish soap. Asking about clean lard, they butcher their own hogs, render the hogfat into lard and then have to clean the lard from bits of whatever is in the rendered lard. I don’t know how the lard is cleaned as we never butchered pigs. After the fat (hog) or tallow (beef) fat is rendered (melted), it can be poured through a sieve, cheesecloth, etc. thus removing all the “burnt bits”…. I’ve only rendered tallow. Makes a beautiful, white bar…cream colored sometimes. I render fat outside…heat and smell is NOT very pleasant. Just a note, be very careful with the lye, not to get it on your skin or in your eyes. My Husband and I make our own soap. We use pretty much the same recipe. But our soap never turns out white it is always a tanish color. Any ideas? Could it be the cast iron pot we use? Erik do you know what kind of pot that soap was made in. I dont think you can use certain metals. But I dont know as we always use cast iron and wood utensils. Your soap may not be white because your lye is still “hot”. I know that sounds strange but believe is or not because lye is an acid it in considered caustically “hot” and can continue to generate heat and a burning effect to the other ingredients. You may want to try letting you lye and water sit a little longer and making it the last ingredient you all to the mix. No it is the temperature my Grandmother use to make what we call hot or cold water lye soap.The cold was off white and the hot was brown in color,It sure does bring back wonderful memories of her.She has been gone to heaven since 1977. Today I learned from an Amish gal not far from the secert in the soap is stirring it until it gels, in the hot sun. I could not get my soap to really clean my laundry the other secert to clean things is rain water or flitered water. Learn something new everyday! You mention “secert” twice. English is not my daily language, and I have never seen that word before, so I looked it up, but it wasn’t listed in the Cambridge Dictionaries. Did you mean “secret”? I’m really sorry that you feel that way! It was certainly not meant that way at all, I really did not realize that it could be understood as such! I really didn’t know if I could be misunderstanding. This is not my language and it certainly wouldn’t be the first time I have looked up something in several dictionaries and for some reason it is not listed. And I keep looking and searching for a long time online, because I’d really like to understand rather than misunderstand because of the challenges using a foreign languages gives you. Almost every time I read something, there is some word I don’t understand, and I try taking that opportunity to learn the correct meaning of that word, so I don’t have problems understanding the next time I come across it. Often it takes a lot of time in trying to read and write correctly… I’m sorry that me trying to clarify caused me to offend you. Sometimes it is very difficult to get things across in writing, without facial expressions and body language – I guess this was an example of that… Again, I’m sorry! I’m not a soap expert – but only make soap in a well ventiliated place – outdoors preferably. Alway sprinkle the lye into the water and NEVER the other way around. Fat can be rendered by boiling it in an equal amount of water until it is melted, letting it cool, and then taking off the fat. Jackie, you will get nicer results if you use an enamelled kettle. The longer the soap sits, the better it will be. our lye soap is very good on the skin. its not real strong. We have friends beg us to make more. They use it for excema, acne etc, And absolutley love it. Even my best friend who could be compared to a Barbie doll fashion queen loves it. We make ours outside over a fire in an old cast iron kettle. Magdalena, I may try a smaller batch in an enamel pot. Thanks for the idea. Yes you can buy lard in a bucket. I have seen it at walmart. Maybe tallow too I am not sure. And I think you find it in the hispanic section. I think they shave off of the bar of soap for the dishwater. My mother used to do that when we were low on money and my father hadn’t gotten paid yet. She’d go to the store and by several bars of Ivory soap and shave off into the hot dishwater. Then I could wash the dishes. I also read that in an Amish fiction story when one of the female characters shaved of pieces from the block of soap into the dishwater. Your mom shaved off soap. I remember mine had a metal wire thingie that had a handle and a cage at the end. You pushed the handle parts together, and the “cage” opened and you put a bar of soap in. Then you could pull that back and forth in your dishwater until it was soapy enough to do the dishes… That basic soap is still for sale in the stores, just as it was back then and still can be used for anything. I remember I was so envious, as all my friends got all those nice soaps and bath foams, and all I got was that, as my parents had heard I should only use that because of my eczema and psoriasis (and it was pretty good advice, except for the fact that we used way too much soap. Especially kids with eczema, should use as little soap as possible! Today they can easily avoid it altogether, as there are alternatives, cleansing lotions/oils!). I’ve made laundry detergent for my family of 6 for the last three years. (I usually have to make it about twice a year.) I definately don’t use this recipe though. I wouldn’t even know where to buy/get lard or lye here in the city. If I knew, I’d be willing to try it. Although I can’t imagine it would be very kind to sensitive skin. Thanks Eric for all you post for un Englishers. I’m really enjoying your site! Melissa, what do you use instead of lye? My pleasure Melissa, glad you like it. One thing I like about running this site is a learn alot, case in point homemade soap! Where online can I purchase amish made soaps and the vitamins and minerals that they sell? There is a wonderful book called “Soap: Making It, Enjoying It” by Ann Bramson. The author is very thorough and explains everything–even a little soap history in the beginning. Please be careful when using lye! This recipe will give a non superfatted soap. aka: laundry soap Ck out recipes by running them through a soap calculator like soapcalc.com Most soaps used for skin have a superfat of 4-6%. That’s 4-6% more fats/oils than it takes for the lye to saponify the fats/oils used in a recipe. IMO, vegan soaps don’t compare to ones that use animal oils like lard. Lard especially is nice because it is close to natural human oils in chemistry. Coconut oil in a soap recipe will give nice lathering properties. Always carefully WEIGH ingredients for a soap recipe using a scale accurate to 10ths of an ounce for best results. A lye heavy soap is dangerous to use. Can someone please tell me where to get lye and pig fat? Do I go to the butcher? Online? Melissa, what do you do to make the laundry soap.? Lye can often be found at Ace Hardware stores or Lowes. At Ace it’s Rooto Household Lye and Lowes it’s Roebic drain cleaner. Must be 100% Sodium Hydroxide, no fillers. 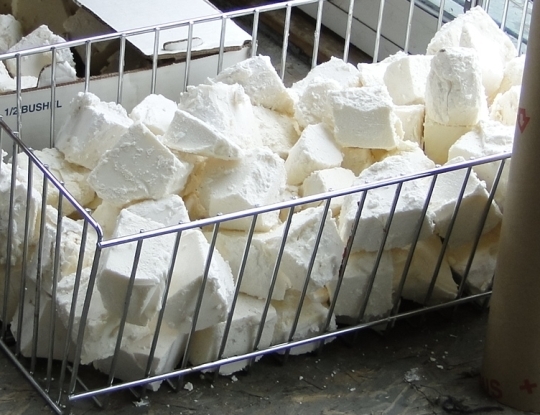 Read up on soapmaking first! !~safety etc. Join a soapmaking forum like craftserver.com Keep pets and kids away and limit distractions. Lye has become more difficult to find because it’s used in the making of Methamphetamines. Lard is at any grocery store, by the pail or the 1 lb brick. I just love homemade soaps. This is an interesting looking soap. It reminded me a bit of “divinity”…this white chocolate almond bark candy that my grandmother used to make. there is no such thing as “fine” lotions and hand soaps at wal-mart. Just to make that clear, I don’t mean to in any way imply that there is anything wrong with detergents, only that they are different. Personally I think natural soaps have some advantages, while for some things some modern products for sure have advantages (e.g. pH-low “soaps” and modern cleansing oils/lotions) over soap for certain needs (e.g. for intimate use and for special needs skin, as with skin diseases like Atopic Dermatitis/Eczema where there is a defective skin barrier that causes certain challenges/problems). An Amish woman sold me some wonderful hand lotion yesterday that actually works! I’ve tried just about everything…even “fine” lotions and it all made my hands worse…bleeding and cracked. She’s an angel. I’ve made both powdered and liquid detergent. The powder is easier to store, but had to be made more often than the liquid. Be careful when rendering fat from hogs. It can catch fire very easily and has caught many homes and people on fire. I haven’t ventured to try to make my own soap – lye is scary and pig fat burning homes and people…yikes! Anyway I found a site that sells Amish soap! Wow! it’s www.amishsoap.wordpress.com. I got some and it’s awesome…looks white and colored – it’s scent is just clean. I just thought you all might like to know. I’m working on getting on a few sites to help encourage me to make soap, but until then! Lard: 🙂 It is what my grandmother still makes her biscuits with and fries her chicken in. She buys in in those big white buckets that you only see little old ladies put in their shopping carts. Oddly enough, she stays so thin. Go figure. That is why it is so white, the lard is the only oil in that recipe. Using vegetable oils like olive oil makes a more off white creamy color and some green oils make actual green soap (grapeseed, avocado). Great to post recipes like that, but a soap recipe that after all involves the potentially very hazardous lye, should involve more information about which precautions to take and not just that, very important information that the soap MUST NOT be used right away, it MUST be cured first (most say a minimum of 3 weeks, preferably 4 weeks or even longer – it gets milder as it ages as the neutralization process goes on. Fresh soap will burn skin! See some say online they never sell soap until it is at least 3-4 weeks old). In common with other corrosives, the major safety concern with lye is its potentially destructive effects on living tissues (e.g., skin, flesh, and the cornea). Solutions containing it can cause chemical burns, permanent injuries, scarring, and blindness—immediately upon contact. Lye may be harmful or even fatal if swallowed; ingestion can cause esophageal stricture. Moreover, solvation of dry solid lye is highly exothermic; the resulting heat may cause additional burns, or, ignite flammables. The reaction between sodium hydroxide and a few metals is also hazardous. Aluminium reacts with lye to produce hydrogen gases. Since hydrogen is flammable, mixing a large quantity of lye (e.g., sodium hydroxide) and aluminum in a closed container is dangerous—especially when the system is at a high temperature, which speeds up the reaction. In addition to aluminum, lye may also react with magnesium; galvanized zinc; tin; chromium; brass; and, bronze—producing hydrogen gas.